recolectada en la zona Sur del Macizo Guamuhaya. Foto: Ángel Moreira..
Peter the Great Bay, Russia. 28 Mar 2012. Oksana Belous. © Oksana Belous (ksu_bio@mail.ru). Published in: Müller, O.F. (1778). Flroa danica. Vol. 5, fasc. 13 pp. 8, Plates 721-780. Havniae [Copenhagen]. Adjective (Latin), producing offsets, bearing progeny as offshoots (Stearn 1973). John et al. (2004) cite Enteromorpha torta (Mert.) Reinb. as a synonym of this species. Swedish: Fingrenig tarmalg (Tolstoy & Österlund 2003). Chinese: Tai-tiao (Arasaki & Arasaki 1983). Hawaiian: Limu 'Ele'ele, Hulu'ilio (Abbott 1984). Japanese: Suji-awnori (Tokida 1954), Suji-aonori (Arasaki & Arasaki 1983). Swedish: Spretig tarmalg (Tolstoy & Österlund 2003). Type locality: "U. p. tubulosa simplex teres, adultior compressiuscula. In fossa ad Nebbelund Lalandiae" [Lolland, Denmark] Lectotype: Müller, 1778: pl. 763, fig. 1: Thallus of D11 strain cultured by Hiraoka fro zoid produced by the thallus originally collected by Takano at the southern coast of Nebbelunde (54°38.933'N, 11°21.583'E) in Lolland Island, Denmark, 14 August 2010, HHIRAOKA001 deposited in Herb. of Kochi Un (epitype) (Cui et al. 2018 Notes: Isoepitypes: HIRAOKA002-004 deposited in Usa Marine Biological Institute, Kochi University. Womersley (1984; 156, 157) reports that the type is from Lolland, Denmark and that it has been lost. Lolland Island, Denmark (O'Kelly et al. 2010). Bae, H.B. (2010). Ulotrichales, Ulvales. In: Algal flora of Korea. Volume 1, Number 1. 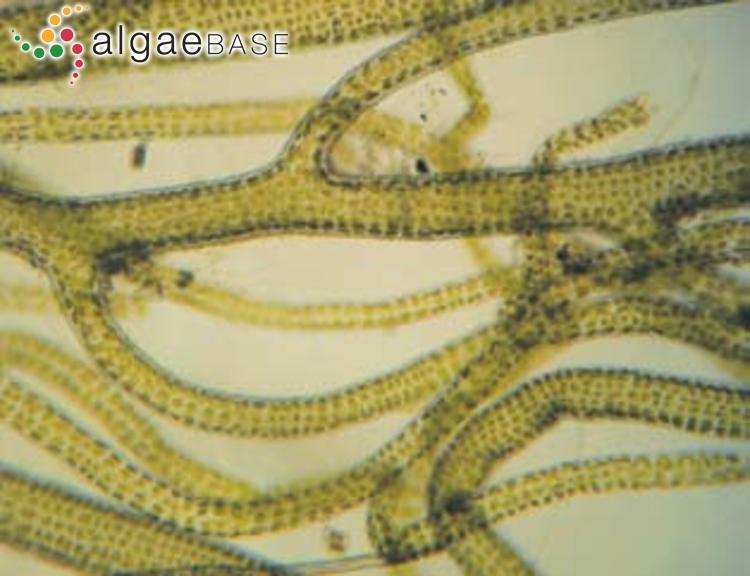 Chlorophyta: Ulvophyceae: Ulotrichales, Ulvales, Cladophorales, Bryopsidales. 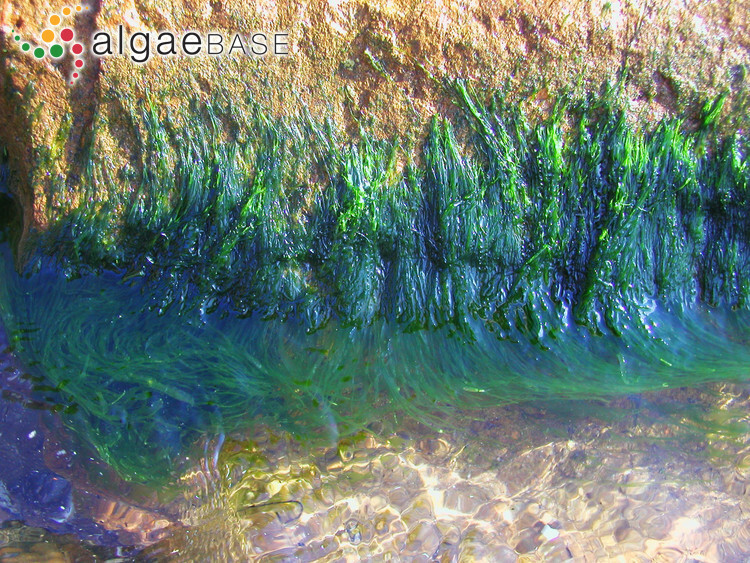 Marine green algae. (Bae, E.H., Kim, H.-S., Kwon, C.-J., Hwang, I.-K., Kiim, G.H. & Klochkova, T.A. Eds), pp. 7-52. Incheon: National Institute of Biological Resources. Cormaci, M., Furnari, G., & Alongi, G. (2014). Flora marina bentonica del Mediterraneo: Chlorophyta. Bollettino dell'Accademia Gioenia di Scienze Naturali di Catania 47: 11-436. Cui, J., Monotilla, A.P., Zhu, W., Takano, Y., Shimada, S., Ichihara, K., Matsui, T., He, P., & Hiraoka, M. (2018). Taxonomic reassessment of Ulva prolifera (Ulvophyceae, Chlorophyta) based on specimens from the type locality and Yellow Sea green tides. Phycologia 57(6): 692-704. Hayden, H.S. & Waaland, J.R. (2004). A molecular systematic study of Ulva (Ulvaceae, Ulvales) from the northeast Pacific. Phycologia 43: 364-382. Heesch, S., Broom, J.E.S., Neill, K.F., Farr, T.J., Dalen, J.L. & Nelson, W.A. (2009). Ulva, Umbraulva and Gemina: genetic survey of New Zealand taxa reveals diversity and introduced species. European Journal of Phycology 44(2): 143-154, 2 figs, 4 tables. Kirkendale, L., Saunders, G.W. & Winberg, P. (2013). A molecular survey of Ulva (Chlorophyta) in temperate Australia reveals enhanced levels of cosmopolitanism. Journal of Phycology 49(1): 69-81. Leliaert F., Zhang X., Ye N., Malta E.J., Engelen A.E., Mineur F., Verbruggen H. & De Clerck O. (2009). Identity of the Qingdao algal bloom. Phycological Research 57: 147-151. Lindeberg, M.R. & Lindstrom, S.C. (2010). Field guide to the seaweeds of Alaska. pp. [i-]iii-iv, 1-188, numerous col. photographs. Fairbanks: Alaska Sea Grant College Program. Ogawa, T., Ohki, K. & Kamiya, M. (2013). Differences of spatial distribution and seasonal succession among Ulva species (Ulvophyceae) across salinity gradients. Phycolgia 52(6): 637-651. Škaloud, P., Rindi, F., Boedeker, C. & Leliaert, F. (2018). Süßwasserflora von Mitteleuropa. Freshwater flora of central Europe. Bd 13. Chlorophyta: Ulvophyceae (Krienitz, L. ed.). pp. [i]-vii, -288, 182 figs. Berlin: Springer Spektrum. Accesses: This record has been accessed by users 7746 times since it was created. Guo, Y., Wang, H.Z., Wu, C.H., Fu, H.H. & Jiang, P. (2017). Cloning and characterization of nitrate reductase gene in Ulva prolifera (Ulvophyceae, Chlorophyta). Journal of Phycology 53(5): 1035-1043. Huan, L., Gu, W., Gao, S. & Wang, G. (2016). Photosynthetic activity and proteomic analysis highlights the utilization of atmospheric CO2 by Ulva prolifera (Chlorophyta) for rapid growth. Journal of Phycology 52(6): 1104-1113. Wu, H., Shin, S.K., Jang, S., Yarish, C. & Kim, J.K. (2018). Growth and nutrient bioextraction of Gracilaria chorda, G. vermiculophylla, Ulva prolifera, and U. compressa under hypo- and hyper-osmotic conditions. Algae. An International Journal of Algal Researche 33(4): 329-340. Wendy Guiry in Guiry, M.D. & Guiry, G.M. 2019. 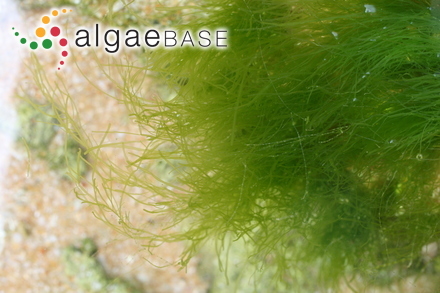 AlgaeBase. World-wide electronic publication, National University of Ireland, Galway. 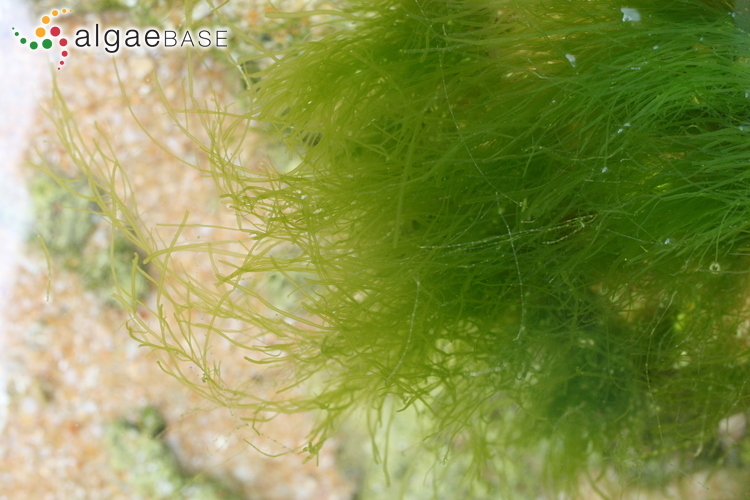 http://www.algaebase.org; searched on 19 April 2019.